Fred W. Krüger is Full Professor of Geography at the University of Erlangen-Nuremberg, Germany. His research and teaching interests, committed to cross-disciplinary approaches, focus on Development Geography and on Urban Studies. Major research fields in the Development Studies arena cover linkages between culture(s) and risk, with a focus on theoretical approaches and the empirical, actor-oriented analysis of poverty (especially in cities), vulnerability, livelihood security, and disaster prevention and preparedness. A regional focus lies on southern Africa. 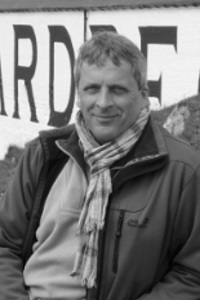 In Urban Studies, he specialises in issues of the „just city“ and the „right to the city“, in urban planning and urban everyday cultures, and the social production of urban public spaces. Current research and teaching activities focus on interlinkages between culture (in its broadest and non-essentialistic sense), human action, the environment, risk and disasters. AfriCity, a major BMBF/DAAD funded project, looks into linkages between adaptation, livelihoods, risks and the right to the city in Sub-Saharan African cities. Research projects funded by the German Research Foundation (DFG) investigate into the impact of HIV/AIDS on human livelihoods and society in Botswana. Smaller-scale studies include „Urban Coolture – Why some urban places are hip and others are not“. Past third-party funded research activities in the context of the „Global South“ included involvement in the international research initiative on „Urbanisation and Its Impact on the Use of Natural Resources in Africa“ funded by the Volkswagen Foundation, and also involved urban planning issues, the festivalisation of urban governance, social vulnerability patterns, and drought management and food security in southern Africa. He is a member of the board of directors of the Institute of Geography. In the past, he held positions as Head of the Department of Geography and Geosciences, as Vice Dean of the Faculty of Sciences, and as Dean of the former Faculty of Natural Sciences III. Most people who live in places that are exposed to serious hazards are aware of the risks they face, including earthquakes, tropical cyclones, tsunami, volcanic eruptions, floods, landslides and droughts. Yet they still live there because, to earn their living, they need to or have no alternative. Culture in its broadest sense, including experiences, everyday routines, attitudes, actions and beliefs, enables people to live with risks and make sense of their lives in dangerous places. Sometimes, though, unequal power relations are also part of culture, and those who have little influence must inevitably cope with threatening environments. The report examines why people choose to live in hazard-prone locations, and how culture, beliefs, norms, attitudes, behaviours, practices or actions enable them to live with the risks they face. It also looks at the organizational culture of agencies working in the fields of DRR and CCA, and challenges the widespread faith in community-based activities. Finally, the report indicates starting points for organizations to better align their actions with the way people think and act. Published annually since 1993, the World Disasters Report brings together the latest trends, facts and analysis of contemporary catastrophes and their effect on vulnerable populations worldwide. Initiated by the IFRC, it convenes eminent researchers, authors and development and humanitarian aid practitioners to highlight the most vital emerging issues and trends on a yearly basis. 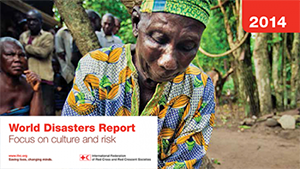 The World Disasters Report is IFRC’s flagship publication and a key resource for the aid sector. The Editors and Lead Authors of the 2014 World Disasters Report were Terry Cannon, Lisa Schipper, Greg Bankoff and Fred Krueger. This list contains selected publications only; those before 1994 have been entirely omitted. Dürre, Einkommenstransfers und Verstädterung in Botswana. Geographische Rundschau, Jg. 46, Heft 10, Braunschweig, 1994. S. 562-569. Urbanization and Vulnerable Urban Groups in Gaborone/Botswana. GeoJournal, 34.3, Dordrecht, Boston, London, 1994. S. 287-293. Deutsche Stadtplanung im Umbruch? Die Bebauung des Freiburger Rieselfeldes als Ausdruck einer neuen Planungsphilosophie. Regio Basiliensis, 35. Jg., Heft 3, Basel, 1994. S. 161 – 170. Überlebenssicherung in Städten Botswanas. Zeitschrift für Wirtschaftsgeographie, Jg. 39. Heft 1, Frankfurt a. M., 1995. S. 14-27. Sozioökonomische Prozesse in Asien und Afrika, Band 1, Pfaffenweiler, 1997. Taking advantage of rural assets as a coping strategy for the urban poor. Environment and Urbanization, Vol. 10, No. 1, London, 1998. S. 119 – 134.
reprinted in: C. Tacoli (ed. ): Rural-Urban Linkages. London, Sterling, 2006. p. 229-243. Identity building and social transformation: the cases of Namibia and Botswana compared. GeoJournal, 46, Dordrecht, Boston, London, 1998. S. 79 – 87. Drought hazards and threatened livelihoods. Environmental perceptions in Botswana. In: Lohnert, B. u. Geist, H. (eds. ): Coping with Changing Environments. Aldershot, 1999. S. 175 – 190. Urbanization and Vulnerability Patterns in Botswana. In: Drescher, A., Dittrich, Ch., Krüger, F. (eds. ): Urbanization, Vulnerability and Resource Management in Developing Countries, APT-Reports, No. 11, Freiburg, 2000. S. 53 – 59. „Drought is all about votes!“ – Zur asynchronen Gleichzeitigkeit gesellschaftlicher Umbrüche in Botswana. In: Krüger, F., Rakelmann, G. u. Schierholz, P. (Hrsg. ): Botswana – Alltagswelten im Umbruch. Münster, Hamburg, London, 2000. S. 33 – 52. Facettes of a Changing Society. Afrikanische Studien, Bd. 14. Münster, Hamburg, London, 2000. (mit G. Rakelmann, P. Schierholz; Hrsg.) LIT-Verlag. Einflußfaktoren des sozialen Wandels in Botswana. In: Bähr, J. u. Jürgens, U. (Hrsg. ): Transformationsprozesse im südlichen Afrika – Konsequenzen für Gesellschaft und Natur. Kieler Geographische Hefte, Band 104, Kiel, 2000. S. 49 – 62. Die lautlose Tragödie. Roche-Magazin, Nr. 68. Basel, 2001. S. 4 – 22. (mit Hiltrud Herbers, Saskia Bausch, Klaus Geiselhart and Volker Wulff; also published as The silent tragedy. Roche Magazine Special Edition 68 „Aids in Africa“, Basle, 2001. From Winner to Loser? Botswana´s Society under the Impact of Aids. Petermanns Geographische Mitteilungen, Heft 3, 2002. S. 50 – 59. Akteure im Risikomanagement: Dürre, Alltagshandeln und staatliche Intervention im südlichen Afrika. Zur Relevanz sozialwissenschaftlicher Umweltstudien für die Entwicklungspraxis. Umweltpsychologie, Heft 1, 2002. S. 92 – 99. Food for Cities: Urbanization – Linking Development Across the Changing Landscape. (selected chapters, in cooperation with FAO, A. Drescher and D. Iaquinta (eds.)). Rome, 2002. Livelihoods, Urbanization and the Rural-Urban Interface in African Growth-based Economies: The Case of Botswana. In: Sassen, S. & Marcotullio, P. (eds. ): EOLSS UNESCO Encyclopedia of the Social Sciences. Oxford, 2002 (also: Online Edition 2004). Handlungsorientierte Entwicklungsforschung – Trends, Perspektiven, Defizite. Petermanns Geographische Mitteilungen, 147, Heft 1/2003. S. 6 – 15. Lässt sich Stadt überhaupt planen? Zur Steuerungsfähigkeit urbaner Gesellschaften. In: Blessing, W. u. Pehle, H. (Hrsg. ): Die Zukunftsfähigkeit der Stadt. Erlangen, 2004. S. 265 – 294. Imagestudie Innenstadt – Image und Attraktivität der Erlanger Innenstadt: Stärken, Schwächen, Anregungen. Innenstadtentwicklung, Nr. 3, 2006 (hrsg. von der Stadt Erlangen). Epidemics – Epidemien. In: Oswalt, P., Schirmel, H., Kulturstiftung des Bundes (Hrsg. ): Atlas of Shrinking Cities. Berlin, 2006. pp 58- 59. Der Nürnberg Atlas. Köln, 2007. (mit Wolfgang Baumann, Michael Diefenbacher, Hiltrud Herbers, Dorothea Wiktorin; Hrsg.) Emons-Verlag. Erklärungsansätze und Analysemodelle „mittlerer Reichweite“. In: D. Böhn u. E. Rothfuß (Hrsg. ): Entwicklungsländer I (Handbuch des Geographieunterrichts, Bd 8/1), Köln, 2007. S. 73 – 79. Die HIV-/AIDS-Krise im südlichen Afrika: Lokale und globale Herausforderungen. In: Mächtle, B., Gebhardt, H., Schmid, H., Siegmund, A. (Hrsg. ): Risiken und Sicherheit in einer globalisierten Welt. HGG-Journal 21, 2007. S. 59 – 69. Unsicherheit, Vertreibung, Flucht. Migration und Gewalt im subsaharischen Afrika. Geographie und Schule, Heft 177, 2009. S. 25 – 32. Widerspenstige Städte – Urbanes Leben und der Zwang der Normen. In: Weber, A. (Hrsg. ): Städtische Normen – genormte Städte. Zur Planung und Regelhaftigkeit urbanen Lebens. Stadt in der Geschichte, Band 34. Ostfildern, 2009. S. 177 – 191. Leben in der Krise: HIV/AIDS in Botswana aus Sicht der geographischen Risikoforschung. Ber. Naturf. Ges. Freiburg i. Br., 101, 2011. S. 83 – 96. Spaces of risk and cultures of resilience. HIV/AIDS and adherence in Botswana. In: D. Müller-Mahn (ed. ): The Spatial Dimension of Risk. London, New York, 2013. pp. 109-123. Lehre in allen Studiengängen, Fokus auf Entwicklungsforschung und Stadtforschung. Zuletzt u.a. Master-Lehrforschung zu „Umwelthandeln in Botswana“ und zu „Stadt der Zukunft 2030-2050„, Master-Forschungswerkstatt zu „Cultures and Disasters“, „(Un-)Ordnung im Entwicklungskontext“. 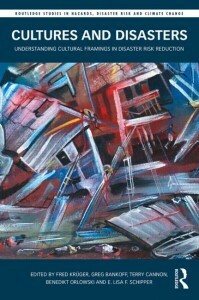 Vorlesungen und Seminare zu Urban Studies, Empir. Sozialforschung u.v.m. Im Januar 2000: Landeslehrpreis Baden-Württemberg 1999 des Ministers für Wissenschaft, Forschung und Kunst. Prof. Dr. Fred Krüger, Professor für Geographie, und Dr. Michael J. Fried vom Lehrstuhl für Angewandte Mathematik 3 der Friedrich-Alexander-Universität Erlangen-Nürnberg (FAU) gehören zu den besten Dozenten im Freistaat. Die beiden Wissenschaftler wurden jetzt vom Bayerischen Wissenschaftsminister Dr. Wolfgang Heubisch mit dem „Preis für gute Lehre“ ausgezeichnet. Der Preis, den insgesamt 15 Dozentinnen und Dozenten verschiedener bayerischer Universitäten erhielten, ist mit 5.000 Euro dotiert. Professor Krüger wurde von der Fachschaftsinitiative Geographie der FAU für den Preis vorgeschlagen. Die Studierenden lobten seine nachhaltigen Lehrmethoden und seine praxisnahe Vermittlung der Lerninhalte. Sie halten die Seminare und Vorlesungen von Prof. Krüger für besonders relevant für das Studium und spätere Berufschancen. Außerdem hoben die Studierenden hervor, dass er seine Lehrveranstaltungen mit seinen Forschungsschwerpunkten verbinde. Dabei vermittle er nicht nur „Lehrbuchwissen“, sondern sie haben auch an der aktuellen Forschungsarbeit teil. Dr. Fried leistet seit Jahren einen besonders guten Beitrag zur Grundlagenausbildung der Studierenden der Technischen Fakultät im Fach Mathematik für Ingenieure. Der Naturwissenschaftler steht damit exemplarisch für die enge interdisziplinäre Zusammenarbeit der verschiedenen Fakultäten an der FAU. Die Studierenden bescheinigen Dr. Fried, dass er Mathematik lebendig und verständlich vermittle. Er lege zudem in seinen Veranstaltungen großen Wert darauf, dass der Lehrstoff für die angehenden Ingenieure praktisch anwendbar ist. Der Preis für gute Lehre würdigt die Arbeit der besten bayerischen Hochschullehrerinnen und Hochschullehrer und soll ein Anreiz sein, sich vermehrt in der Lehre zu engagieren. Die Preisvergabe erfolgt auf Vorschlag der Universitäten und setzt voraus, dass mindestens zwei Studienjahre lang hervorragende Leistungen in der Lehre an einer Universität in Bayern erbracht wurden. Die Studierenden sind bei der Auswahl beteiligt.